Sitting before a wall bursting with family photographs and colorful messages exuberantly drawn in his children’s writing, Jerry Vanderstelt is fielding a flurry of nonstop activity inside his office at Van’s Car Wash & Quick Lube this Tuesday afternoon. In between reminiscing with his father, John Vanderstelt, about their business over the years, Jerry Vanderstelt, who owns Van’s, is something of a human tornado: navigating employees’ greetings and questions, bringing out decades-old articles detailing his company’s accomplishments, proudly telling stories of his wife and two children, preparing for Van’s Car Wash & Quick Lube 50th anniversary celebration this weekend. It’s a whirlwind of a scene that’s emblematic of the business that’s about to turn 50 years old, a scene rooted in family, in hard work, in community. 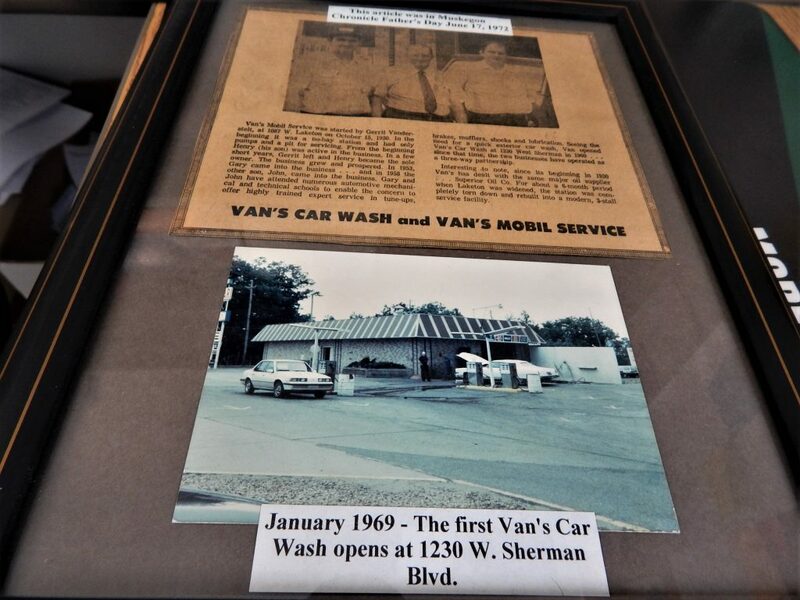 A photo of the first Van’s Car Wash, which opened in 1969. 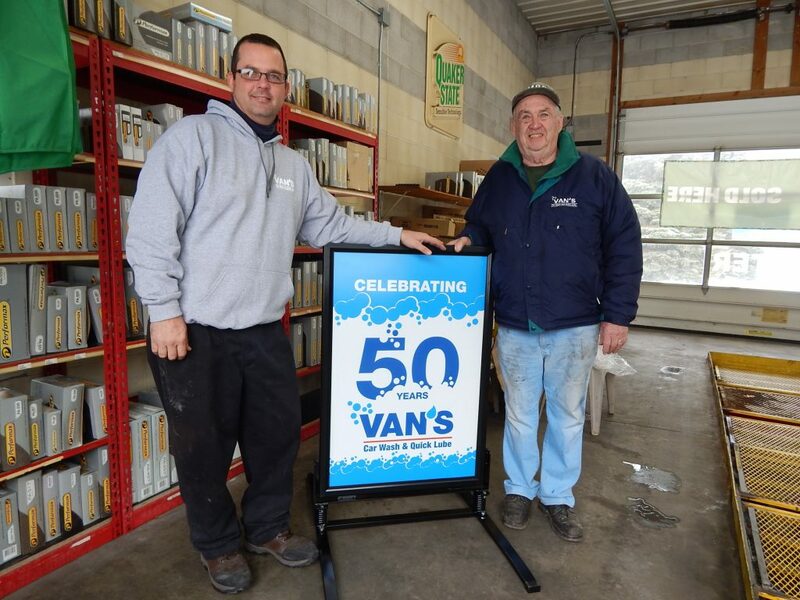 Now, to say thank you to their town, Van’s Car Wash & Quick Lube is throwing a 50th anniversary party this Saturday, Jan. 26. 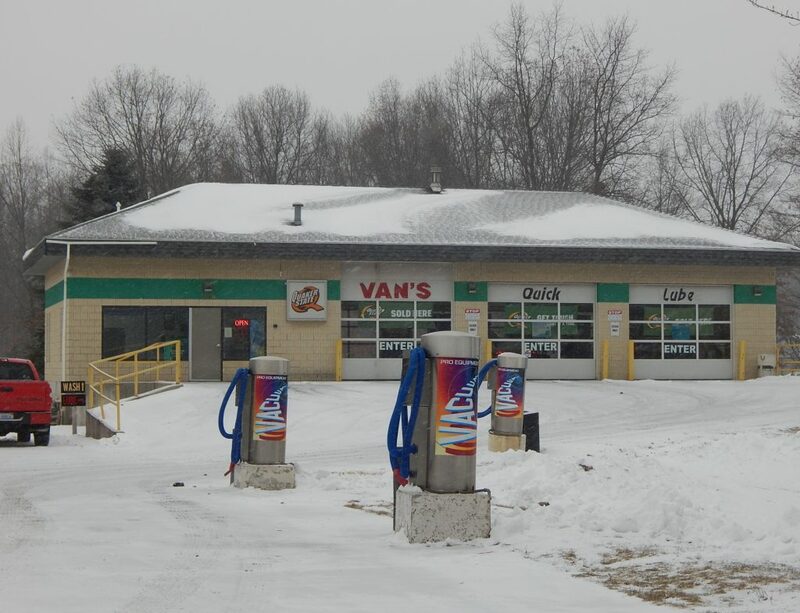 To mark five decades of service to Muskegon, Van’s Car Wash will celebrate with special deals one weekend every month in 2019; for their kick-off event this Saturday, they will offer anniversary throwback pricing at each of the seven locations, including $1 car washes and $10 oil changes. As they prepare for Saturday’s festivities, members of the Vanderstelt family have been remembering the past 50-plus years, and the ensuing stories are ones to which we can all relate—stories of family, of learning how to make it in this world, of hard work and long days. Of parents hunkering down in the office, but still managing to make it to their children’s sporting events. They’re stories of the ripple effect one business has on a community: of the impact that mentoring employees, providing work for people, and raising money for local charities creates in our world. “It’s very unusual that you have the fourth generation running a company and be so successful—he’s done a phenomenal job,” John Vanderstelt says of his son, Jerry. 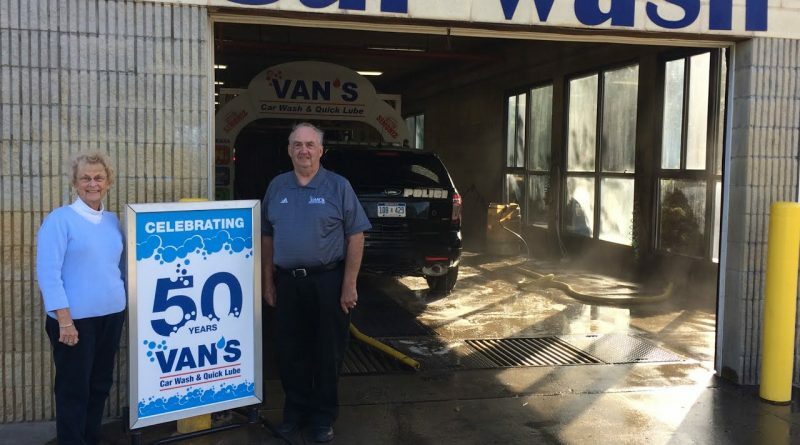 Jerry Vanderstelt grew up working in the family business and purchased Van’s Car Wash from his father in 2006, 37 years after his grandfather, father and uncle opened the first Van’s Car Wash on Jan. 24, 1969 and 76 years after his great-grandfather launched the very first Van’s. Gerrit Vanderstelt, an immigrant from the Netherlands, and his son, Henry, opened Van’s as a full service gas station at 1087 W. Laketon Ave. in Muskegon on Oct. 15, 1930—a time when Muskegon was quite a bit different from today. The business then made its home on Laketon Avenue when it was a dirt road surrounded by expanses of open space. “He crossed the ocean and decided to start a garage; it was one of the first gas stations in Muskegon,” Jerry Vanderstelt says, glancing down at a photograph of his great-grandfather, clad in a dapper 1930s trench coat and fedora while standing outside his auto repair shop. Since the day Van’s opened in 1930, the business, its owners and its employees have navigated the ups and downs the world has thrown its way, from the Great Depression and World War II to the economic recession in 2007. The Vanderstelt family has indeed made its way through it all—but they’ve done more than survive. This business run by four generations of the same family has grown, believed in employees like they are family (so much so that some staff members have worked at Van’s for decades), and given back to the community. The Van’s Halloween haunted car wash, for example, launched four years ago and has since raised about $18,000 for local nonprofits. As John Vanderstelt’s father, Henry, took care of the business, John and his brother, Gary, spent much of their childhoods and adult lives there. In 1969, the three of them branched out from the auto repair business and decided to launch the first Van’s Car Wash on Jan. 24, 1969—the same day that Jerry’s older brother, Jeff, was born. Sharon, left, and John Vanderstelt at Van’s Car Wash. Ten years later, in 1979, Henry Vanderstelt retired and Gary and John Vanderstelt took the reins. Then, in 1987, Gary Vanderstelt bid adieu to the family business and sold the original location on Laketon Avenue, while his brother, John, reopened the full-service shop at their Sherman Boulevard location. 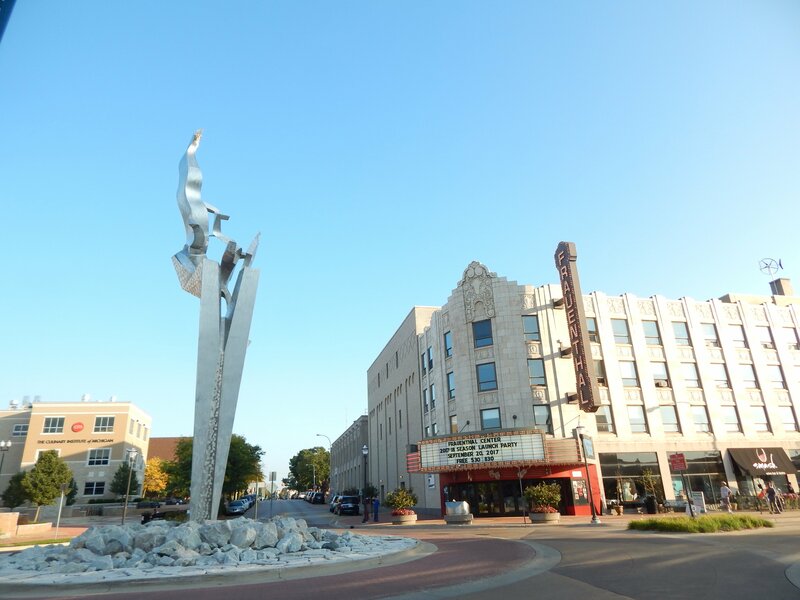 A couple decades later, after spending much of his childhood and early adult life working at the family business, Jerry Vanderstelt headed south for a job opportunity down south—but he couldn’t get Muskegon, and his family’s business, out of his head. So, he and his wife, Claudia, returned to Muskegon in 2005 and are raising their two children, Zoe, 14, and Ian, 10, here. Now, after a whirlwind 14 years as the head of the company, Jerry Vanderstelt is looking forward to the times to come, including celebrating their 50th anniversary year. “This year is going to be focused on our 50 years and being thankful to the community,” he says. 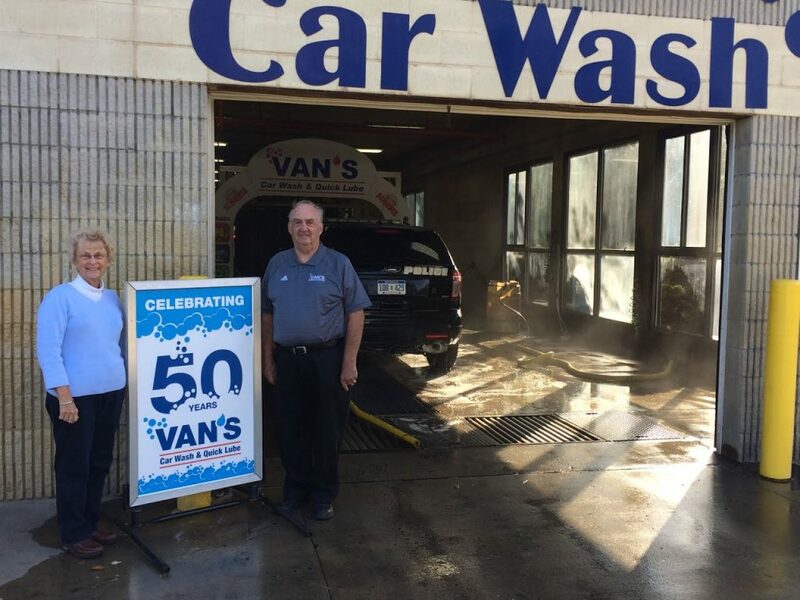 For more information about Van’s Car Wash & Quick Lube’s 50th anniversary celebration, please visit their Facebook page and website.